Ancient Egypt was among the richest ancient civilisations when it came to culture and religion. Just like every other aspect of life, Egyptians had rich custom of using various precious metals for ancient Egyptian jewellery. The culture of using jewellery was prevalent among all classes of society, although extensive use of precious metals was confined to upper classes. Additionally, both men and women made use of jewellery and lavish use of jewels were made for statues of kings and gods. Even the dead people were buried with jewellery which, as the religious belief went, they used in the underworld. The history of jewellery can be traced back to pre-historic times when jewellery was made of seashells, bones, and various stones. With the establishment of society, access to precious metals and gems increased and this gave rise to a rich culture of jewellery and adornment. Gold was discovered in ancient Egypt over five thousand years ago and this discovery can be considered a turning point in the culture of ancient Egyptian jewellery. Among various other things, use of jewellery signified social status, power, and religious affiliation. Other than gold, use of silver and other precious gems was also common. Various types of metals and gems were commonly used in ancient Egyptian jewellery. Copper and gold were the most commonly used, with the masses extensively using Copper while the upper classes used Silver. Both these metals were abundantly available from the deserts of Nubia. Various shades of gold were used in jewellery, including gray, rose, and reddish brown. This variation of colours was achieved through the mixing of various elements such as iron, copper, and silver into gold. White collar necklaces were the most common type of jewellery which was made of rows of beads shaped into various animal and flower shapes. Pharaohs made extensive use of jewellery which was used to signify their important political, religious, and social status. 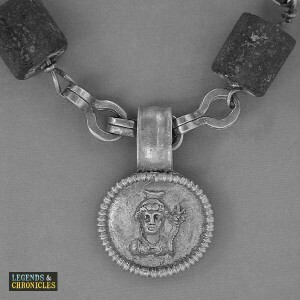 The collar necklace was the most favourite type of jewellery used by Pharaohs. Starting from the Eighteenth Dynasty, these necklaces were given by Pharaohs to various officials, soldiers, and dignitaries as a mark of honour. Extensive use of gold was made in these collar necklaces along with small parts of other metals. A quintessential type of collar used by Pharaohs was called “Shebyu” which was first used by Thutmosis IV during the New Kingdom. Pharaohs were also buried with extensive jewellery which was thought to accompany them in the underworld. Other than Pharaohs, Egyptian jewellery was extensively used for the statues of gods. One reason of wearing jewellery by the people was the religious belief that this made them attractive in the eyes of gods and thus resulted in divine favours. It was also common to decorate jewellery with gods and religious symbols to please the gods. While burying a dead person, it was customary to bury a red-coloured necklace with them which was through to appease the goddess Isis. 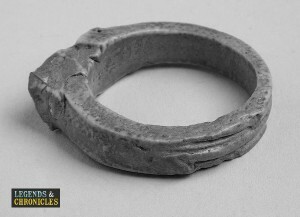 A simple Egyptian Shen Ring. Cartouche in ancient Egypt was a special kind of hieroglyph which was an oval shape with a horizontal line and signified that the text enclosed was a royal name. In ancient Egyptian jewellery, it was common to make amulets in the form of cartouche displaying the names of kings and to bury with them in the tombs. These cartouches were reserved only for Pharaohs and were thought to protect them from evil spirits in the afterlife. Thus a cartouche was among those pieces of ancient Egyptian jewellery which were exclusive to the Pharaohs for bringing good luck and protection from evil. In ancient Egypt, Ankh was a symbol of everlasting life and immortality. It was also known as breath of life or key of the Nile. It consisted of a hoop shape placed on the top of a cross shape and had significant importance in religious symbolism. In ancient Egyptian language, the world “ankh” also meant mirror which represented a mirror to the soul. It was common with Egyptian jewellery to make ankh-shaped pedants which were thought to bring good luck and everlasting life. Mirrors of beaten metal were also formed into ankh shapes for decorative and religious reasons. 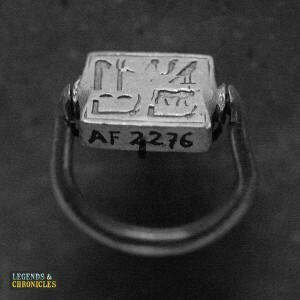 Among the oldest items of Egyptian jewellery, we can include faïence beads. It was a sintered-quartz ceramic which reflected light and created various bright colours. It could also be moulded into the shape of vessels and various other objects. It was commonly used in beads and small statues and was prevalent among both common people and upper classes. Other than being used in jewellery, it was also used in making cups and bowls as well as wall titles for decoration. Finally, it could also be used in fishnet dresses mainly used by the elite. A gold Egyptian medallion and necklace. Other than using jewellery to complement the clothing, it was also used in making dresses. A clear example of this was the use of faïence beads in fishnet dresses. Among the Pharaohs, the most common elements of ancient Egyptian jewellery to go along with clothing were headdresses and crowns. Just like other articles of jewellery, rich use of gold was made in these crowns and headdresses. Use of make-up and perfume was common among all classes and both sexes and there was even a god of perfume known as Nefertum. Thus the jewellery of Egypt of this time mostly accompanied the everyday dressing of common people as well as the elite. Ancient Egyptian jewellery was rich and diverse, the discovery of gold about five thousand years ago was an important landmark which changed ancient Egyptian jewellery as gold began to be used extensively. Other metals used along with gold included silver, copper, iron, and various precious gems. Jewellery was used by all social classes and both men and women. Jewellery was also used for the statues of gods and in temples. Finally, it was buried with the dead and was thought to accompany them in the afterlife.